Successful business leaders understand the need to utilise data effectively and balance that with an appreciation of how their customers interact with their product or service. To accurately profile customers you’ll need to acquire the right mix of data analytics using intelligent technologies. A customer journey map features the path that your potential consumer interacts with your product or service from the beginning to end. It allows for an assessment of the customer experience and incorporates human elements of customer behaviour as well as an assessment of data. This article emphasises the importance of customer journey mapping, data capturing and animation. It provides insights on why customer journey modelling is crucial for your business and customers. Business leaders benefit from customer mapping from being able to monitor the success of the entire customer journey from the outset. Business decisions can be altered and fine-tuned according to the feedback to enhance the user experience from a strategic perspective. Customer mapping is also vital for the sales and marketing teams. Mapping can accurately pinpoint weaknesses in the customer journey and identify where customers are dropping out. Your sales and marketing teams will be able to use customer mapping to link with IT and business strategists, and identify room for improvement for sections of the customer journey to increase conversion rates. A customer journey map provides an insight into the original profile of customers and what they desire from your product or service. Mapping provides analysis of what channels are having success and helps teams to identify holes in the chain. With this information your IT team can deliver customer requirements by solving common problems such as ambiguous technology solutioning (requirements , design, build & test). Starting with an end goal in mind for your customers makes it possible to create your own customer journey map. It is important to consider two important aspects of the customer journey. Firstly, consider the customer experience and secondly consider how your business creates a strategy around this experience. Importantly, how customers define their user experience will directly affect how you manage the second stage internally. When you have enough data and information on the customer experience, you can use the analytics effectively to manage the entire e-commerce experience. Both stages of the customer modelling process are interdependent and require constant checks and balances to ensure you remain on the right track. The customer experience is not just quantified by numbers. 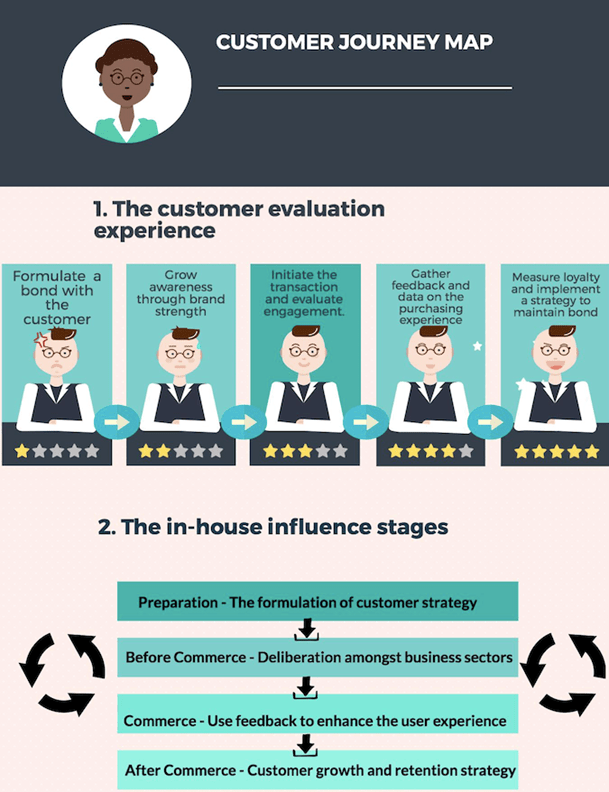 It requires a real in-depth analysis of engaging with customers to review their satisfaction levels. Once you understand their sentiments about your product, you can experiment with improvements and repackage how you deliver your product or service. Gathering feedback takes time and effort and can require a high level of emotional intelligence. Don’t be discouraged if it takes time to get the most out of your customer journey model. After you have created a customer journey map, the next step is to know what data to use and how to analyse and track it to benefit your decision-making and digital strategy. This checklist provides a more detailed insight at what you should be measuring when evaluating your customer journey model. Knowing what your customers want keeps your business agile. Using this knowledge effectively can provide your business with an advantage over your competition and keep your customers loyal. If you can manage to map out your customer journey using a mixture of customer sentiments and raw data, you will go a long way to improving your software quality and finding success.